During the research for this special, I ran across this performance note on her website: Janis Joplin performs with Big Brother & the Holding Company at the "Wake for Martin Luther King, Jr." concert in New York with Jimi Hendrix, Buddy Guy, Joni Mitchell, Richie Havens, Paul Butterfield, and Elvin Bishop on April 7th, 1968. I went to You Tube, and there's a video and lots of comments including one that says the show took place at the Generation Club in NYC which was owned by Jimi Hendrix. There's so much to learn about her hectic career. 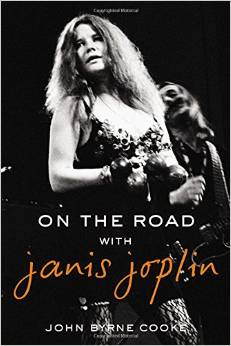 So during this special which airs at 11pm on Saturday, February 7th, 2015, you'll hear an interview I did with her road manager, John Byrne Cooke, who wrote the book, "On the Road with Janis Joplin." He talks about her shows at Monterey, the San Francisco music scene, and their 5-day train trip through Canada. He also talked about her trips to Cincinnati, and the fellow from Cincinnati she fell in love with in May, 1970. And, Mr. Cooke was the person who found her in her L.A. apartment on October 4th, 1970. 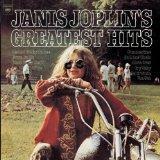 Also included in this Janis special are the memories of Stuart Holman, Bob Nave, and Jeff Siereveld. Guitarist Stuart Holman attended the Janis Joplin concert at Music Hall on October 13th, 1968. (See UC newspaper review in slide show). He talks about the audience watching the Beatles on a small television set tuned to the Smothers Brothers Comedy Hour during Big Brother's performance. Bob Nave, who played with the Lemon Pipers back in the day, shares his thoughts on her concert with Big Brother & the Holding Company at Music Hall on February 7th, 1969. 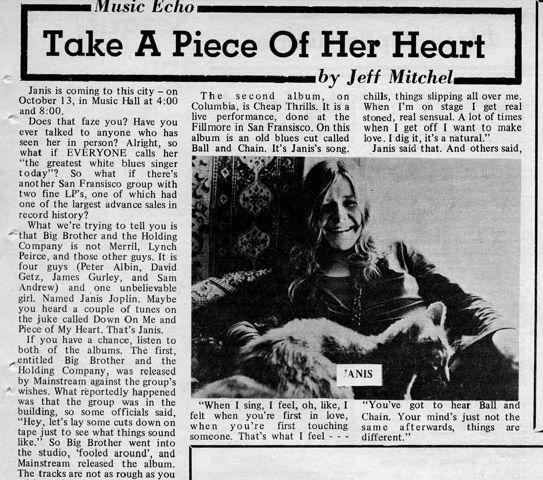 Jeff Siereveld, who worked at the Ludlow Garage, talks about watching Janis Joplin have her photo taken in 1970 at Summerfair in Eden Park...a photo which ended up on the cover of her greatest hits album. And, there's music from the Monterey Pop Festival by Big Brother & the Holding Company and Jimi Hendrix, as well as other Janis songs. 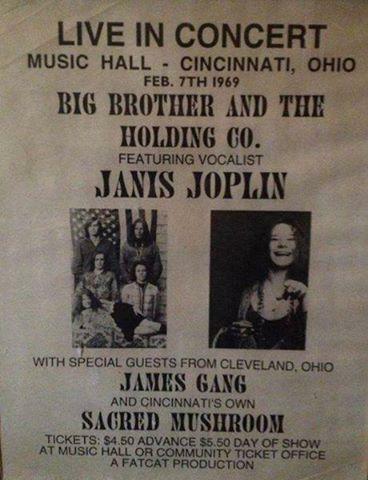 Plus, songs by the Sacred Mushroom and The James Gang who performed at Music Hall the same night as Janis in 1969.